Prehistoric Caddo Tradition Effigy Bottle, AD 1600–1650. Courtesy of Historic Arkansas Museum and Henderson State University Museum. Prehistoric Caddo potters in Arkansas produced elegant containers with intricate engraved decorations for centuries before American settlers arrived. 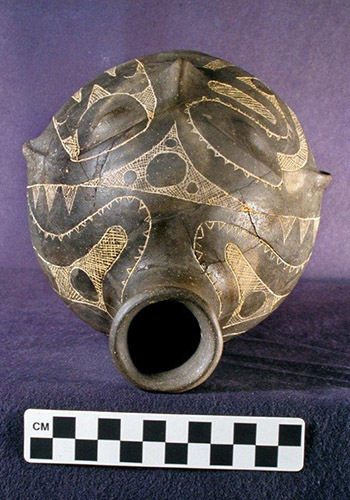 This tradition contrasted with that of the Native people of eastern Arkansas who modeled containers into animal and human effigy shapes and who colored their creations with bright red, white, and black clay slips. 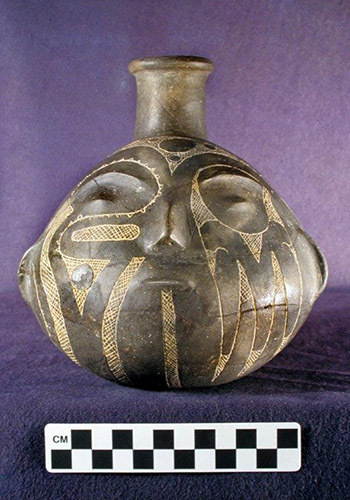 Pictured is a rare example of a Caddo modeled head effigy with stylized and restrained facial features made in the Caddo style. The engraved decoration, usually found on bottles, bowls, and other containers, makes this a unique example of ancient Caddo ceramic art. 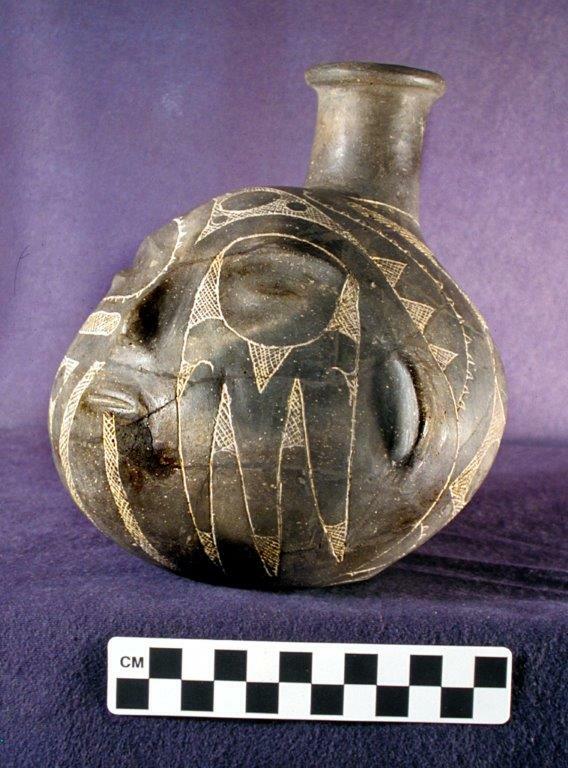 The engraved designs used on this vessel are common in the Ouachita River valley in southwest Arkansas where this vessel was found, except for the figure encircling the left eye. This figure can be understood as a bird wing, a raptorial bird with folded wings, a human hand, or all three simultaneously. The multilayered meanings of this symbol convey information about death, the afterlife, and the spirit world. This bottle, made in the early 1600s, offers a look into the realm of spiritual belief as well as an example of the technical and aesthetic expertise of native Caddo potters who lived in Arkansas. 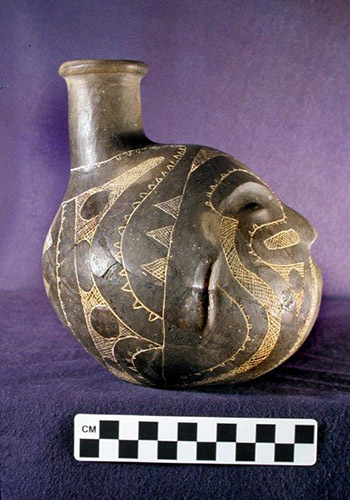 Prehistoric Caddo Tradition effigy bottle profile. Prehistoric Caddo Tradition effigy bottle - front view. Prehistoric Caddo Tradition effigy bottle - top view.